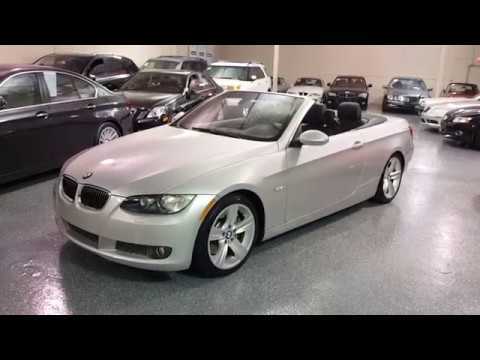 2009 BMW 335i Cabriolet, Titanium Silver with Black Dakota leather, 45K miles, One Owner. Retractable hard top, sport heated seats with memory, heated sport steering wheel with paddle shift. 18-inch sport staggered wheels, keyless comfort access, load-thru rear hatch, lighting package, satellite radio, bluetooth. "M" sports suspension (high speed sync, 155 mph speed limiter). Rain sensing wipers, Xenon lights, automatic climate control, 300hp twin turbo. Great condition inside and out. Fully detailed. EXTRA CLEAN! We offer Credit Union Financing with 60-month terms. We have drive train to bumper to bumper warranties available on most vehicles. All cars are stored indoors for your convenience and are fully detailed. Trade-ins are accepted. We are a small dealership that loves the cars that we sell! Select Motors, LTD. has been visited 13,719,062 times.